So I didn’t realize that I never posted about this book! Astrid Lindgren essentially made my childhood – I was Pippi Longstocking for Halloween at least twice, and have a huge collection of her stories/shows/movies, plus have been to the museum in Stockholm. However, of equal awesomeness is another of Lindgren’s female characters, Ronia, of Ronia the Robber’s Daughter. 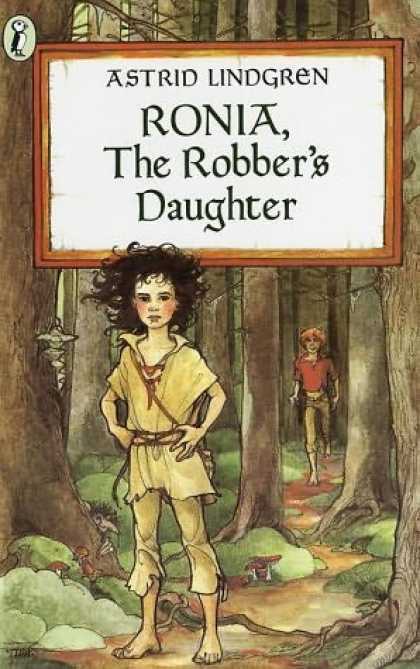 Ronia is the only child of robber chieftan Matt, and thus will one day rule the robber band in their run-down castle, regardless of her gender. One day, she encounters a boy playing in the castle, and discovers that he is Birk, son of rival robber chieftain Borka (whose robbers have taken up residence in the other side of the castle) and thus her enemy. However, after a series of mishaps, she and Birk bond unintentionally, and begin to see the idiocy of their fathers’ feud. 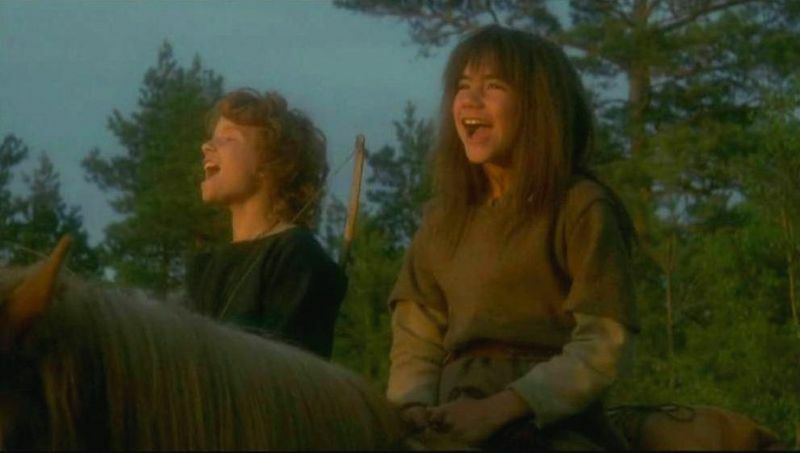 Eventually, rather than see Birk be killed for saving Ronia, the two children run away to live in the woods together. Okay, so Ronia is clearly awesome for a number of diverse reasons. Firstly, she’s a cool little girl who is set to inherit a robber band. Secondly, she has an underlying sense of right and wrong beyond the adults around her – for example, when Borka’s robbers (including Birk) are starving during winter, she constantly smuggles Birk enough food to feed the whole band, because she would not save Birk at the expense of his family, though she doesn’t like them. Eventually, when the feud becomes ridiculous, Ronia realizes that either she and Birk must stop being friends, or they must leave their families. Thus, they decide to leave the castle and live in the woods – which eventually leads to both of their families reconciling and everyone coming together in peace at the end, a la Romeo and Juliet but without the romance or the death. And lastly, Ronia and Birk survive for over a year on their own in the forest. Living in a cave, hunting and growing their food, lasting the snowy winter. Ronia is between eight or ten, and Birk between ten and twelve — take that, Survivor. Even when it’s tough, they would rather die in the wilderness than give up their friendship. Okay, it seems drastic, but also very noble, and they survive in the end anyway. The children teach the adults the moral lesson at the end — typical of Lindgren! Furthermore, Lindgren’s handling of Ronia and Birk’s relationship is deft – they fight (a lot) and act like normal kids, but they also have this very deep bond. They make themselves blood siblings, and hold that tie over their ties to their actual families. There is a definite emphasis on their relationship as brother and sister – this isn’t some pre-teen fluff where the possibility is there, if not addressed. Of note is a particularly sweet scene in which Ronia and Birk meet in a secret tunnel in the castle, and Ronia checks Birk’s hair for lice the same way her mother does to her. In addition (again, this is very typical of Lindgren), Ronia is very do-it-yourself. She’s active, outdoorsy, and obviously fully-capable of taking care of herself. She has her own adventures, and is notorious for her Spring Yell. And gosh darnit, when she sees a problem, she does something about it! This is a short book and quick read, and obviously meant for younger readers (though slightly older than Pippi’s audience). However, I think it’s a great story regardless, and Ronia rates an AJ on the PSA. The book was made into a very successful movie (in Europe at least) in the 80’s, as well as a musical in Germany (yeah, I don’t know about that one either). ← What ho? A feminist bitchfight?